jSQL is an automatic SQL Injection tool written in Java, it’s lightweight and supports 23 kinds of database. It is free, open source and cross-platform (Windows, Linux, Mac OS X) and is easily available in Kali, Pentest Box, Parrot Security OS, ArchStrike or BlackArch Linux. Install Java 8, then download the latest release of jSQL Injection and double-click on the file jsql-injection-v0.79.jar to launch the software. 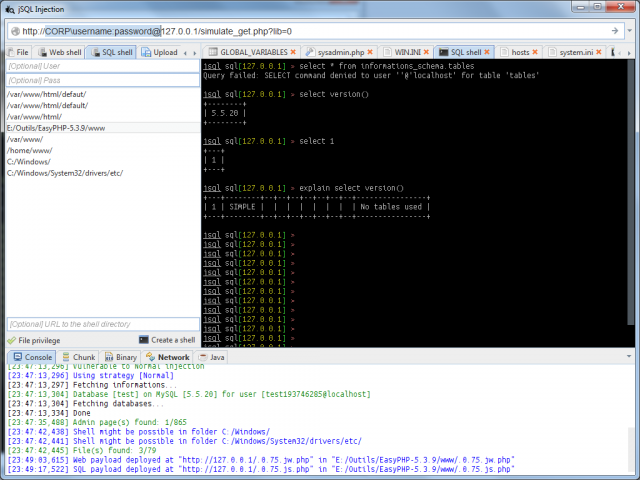 You can also type java -jar jsql-injection-v0.79.jar in your terminal to start the program. If you are using Kali Linux then get the latest release using commands apt update then apt full-upgrade. Should US Border Cops Need a Warrant To Search Devices?